There is so much in store for you when you visit the luxury properties at Bighorn Golf Club. First and foremost, Bighorn Golf Club Real Estate is beyond reproach. Situated at the base of the Santa Rosa Mountains, the views from wherever you live are incredible. Bighorn Golf Club Real Estate is an extremely high end luxury community, many homes are custom built according to the exquisite taste of the elite residents that live there. 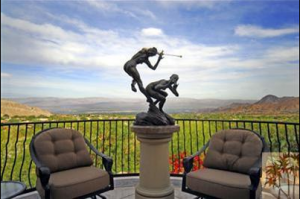 Bighorn Golf Club Homes start out at over $1 million and go all the way up to $7 million. All of the homes that make up the community at Bighorn take full advantage of the extraordinary scenery. Most of these homes are large and the wide open spaces surrounding them are just as expansive. Built with the desert influence of early Spanish style estates, these homes lack nothing modern and contemporary. With the fiery reds and vibrant oranges that color the gorgeous mountains as a backdrop, you really have to see it to understand just how remarkable Bighorn Golf Club Real Estate is. At Bighorn you have your choice between buying a home for resale, or having your home custom built from the ground up. All homes exemplify what it means to enjoy the good life in the perfect climate of sparkling Palm Desert. Bighorn Golf Club defies the average Luxury Real Estate found in Palm Desert. Take for example the club shuttle service. Bighorn provides a property owned limousine service to take you directly to a private jet hangar. That is outstanding service. But it doesn’t stop there. The amenities when you buy Bighorn Club Real Estate are truly too numerous to name here. Suffice it to say that whatever you need, you will find it all within this amazing golf community. For the rest, only those fortunate enough to live at Bighorn Golf Club can boast that these world renowned golf courses are part of the place that they call home. These and many other features of Bighorn Golf Club Real Estate are the reasons why this is one of the most exclusive communities in the world. Made up of over 400 residences and located just outside of Palm Desert, privacy and luxury go hand-in-hand when you make Bighorn Golf Club your home. Elaine has an intimate knowledge of this breathtaking part of Palm Desert. Helping to make dreams come true for both buyers and sellers is what she has done for over two decades. Let her help you to discover Bighorn Golf Club today. You can reach Elaine Stewart anytime. She is always available to help interested buyers or sellers. Elaine looks forward to speaking with you soon.